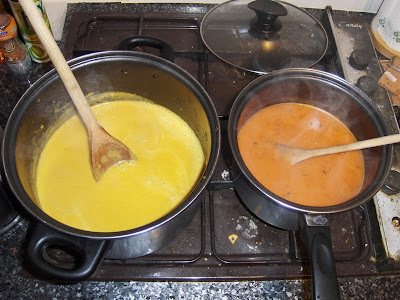 For the Spicy Butternut Squash Soup click here. And here is my recipe for the Chili Tomato and Basil Soup. 1. Gently fry the onion, garlic and chili in the oil for about 5 minutes or until onions become translucent. 2. Add the plum tomatoes and tip the stock into the tin to rinse out the remaining tomato juice. 3. Fill the tin with water and add to the pan. 5. Take off the heat and add the basil. 6. Using a hand blender or transfer to a food processor and blend until smooth. 7. Season to taste and serve or put in pots to take to work.